With the recent rerun of the series on television rekindling its popularity with both the parents and their off-springs, it has been interesting for me to 're-visit' these episodes with a new eye. For a start I used to watch it IN FRENCH as a little girl. 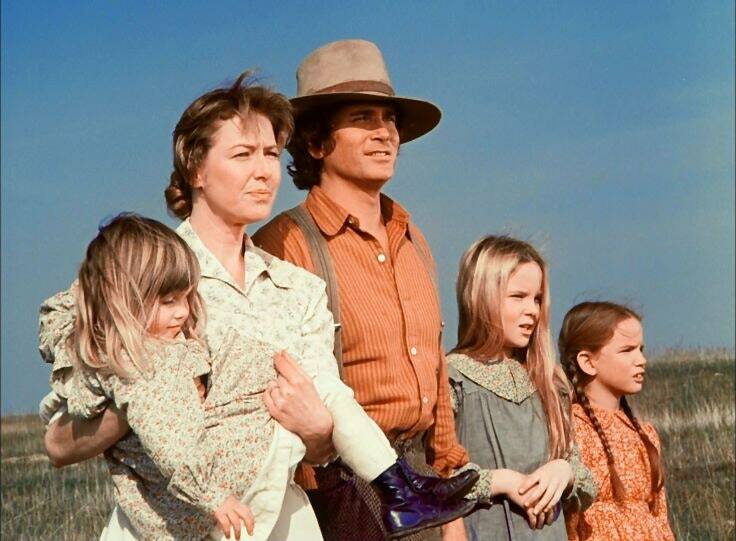 So being able to hear the real voices of Melissa Gilbert and Michael Landon has been a treat in itself. I was also able to do some geeky googly researches on the side and was very surprised to find out interesting facts such as 'Willie Oleson' being Melissa Gilbert's adopted brother in real life or the fact that Alison Arngrim (who played the mean Nellie) was a very shy actress who was so afraid to say her lines that she couldn't look straight at people when talking to them. 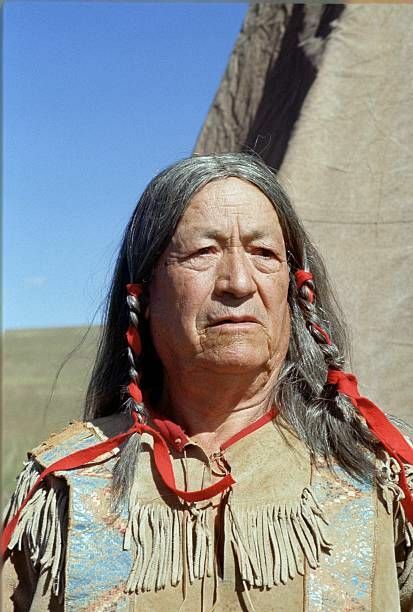 I was also able to find out all about the diverse life journeys that the LHOTP actors had been on since I had last watched the series, some were very moving. But mostly, I was very impressed by the works of Michael Landon, and read with deep interest about his own life (his very difficult chilhood and sad death) and the determination and professionalism with which he led this project (and other side-projects) remaining consistent and true to his message of love and compassion for mankind. The episodes are basically a firm campaign against all kinds of injustices and lies that come with many (new and old) societies. From the preconception about women's ability (and right) to work to racism, the land that was unjustly stolen from the natives, or the prejudice against disabilities or any kinds, Michael seems to have left nothing uncovered in the series. The purists of the classic Laura Ingalls novels may argue that a lot of the original stories have been altered on the screen in the purpose of creating more drama and attract viewers, others have denounced the actors' real lives or the book itself - whose values were not as clearly defined as (and in some instances went against) those portrayed in the TV series - but what stands out to me in both the books and series overall, is a certain search for honesty, peace, love and humanity as well a deep appreciation for the simple treasures life (and nature) brings us all. A great and inspiring message for all generations. Oh and I love the constant mention of Minneapolis and all things Minnesota of course. So it's a massive YAY from me! I have been watching the show again too. Great TV series. Laura is my favorite character. Yay! I watched this show faithfully when I was growing up. Seems like this was talked about a month or 2 ago. Maybe I mixing it up with another site. Yep, loved it. Loved Michael from Little Joe on. Never read the books though. At this point in life I have no plan to. But they're still in all public libraries so maybe, in my elder years who knows. Watched it as a kid and have seen some reruns recently... Mrs. Olson and Nelly are great as comedic villains. The only episodes I skip are melodramatic blind school stories... Read the books as a kid, too. She used to be my favourite too when I watched the show as I was growing up, but now I love them all. I think I read somewhere it was actualy Michael Landon himself who had recruited the actors, and they were all perfect for each of the given roles. Let's not forget the mudfight episode when Laura and Nellie are fighting over Almanzo... 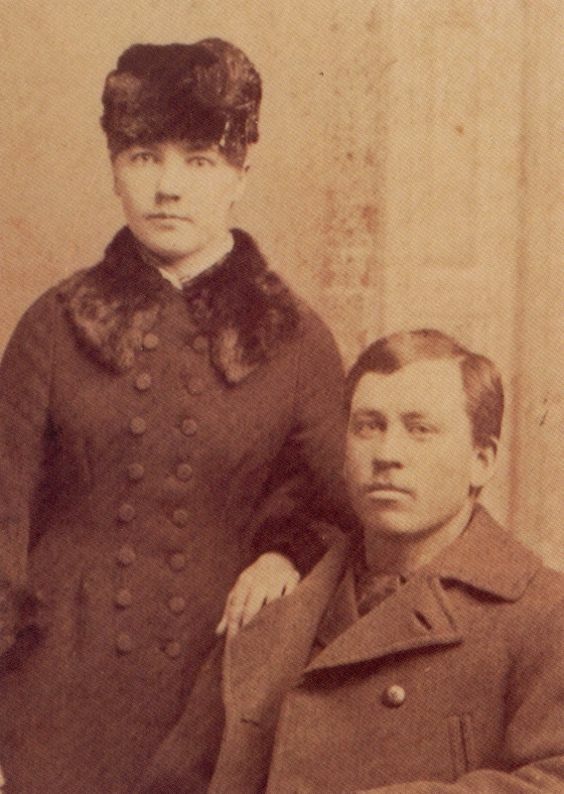 It was not always all peaceful at Walnut Grove and when all else failed, the Ingalls sure knew how to defend themselves! I think Katherine McGregor (who plays Harriet Oleson) is a wonderful actress, she really does spice it up and stops the show from being too serious. I particularly love her in the episode when she wants to add Arts and French to the curriculum and decides to take the subjects in her own hands (Season 07, Episode 16 'Goodbye Mrs Wilder')... She's hilarious and so are her interactions with her husband, Nels (played by Richard Bull). It's been a while since I've seen episodes, but everytime I hear the theme music I smile. No other man for Laura... "Pa, I'm not a little girl, I'm a WOMAN!" Loved it. Watched it every week while I was growing up. I was the only girl in a house full of brothers, we each got to pick 1 show a week to watch. I always picked this one. They hated it. I'm went looking for how long it ran, 9 years, and I'm looking at the list of how many episodes each character was in. I find it funny that Carrie was in more episodes than Mary we hardly noticed Carrie. I read all the books too. My cousin just visited Laura's house in Mansfield Missouri, these are her pictures. This is Laura and Manly's house. 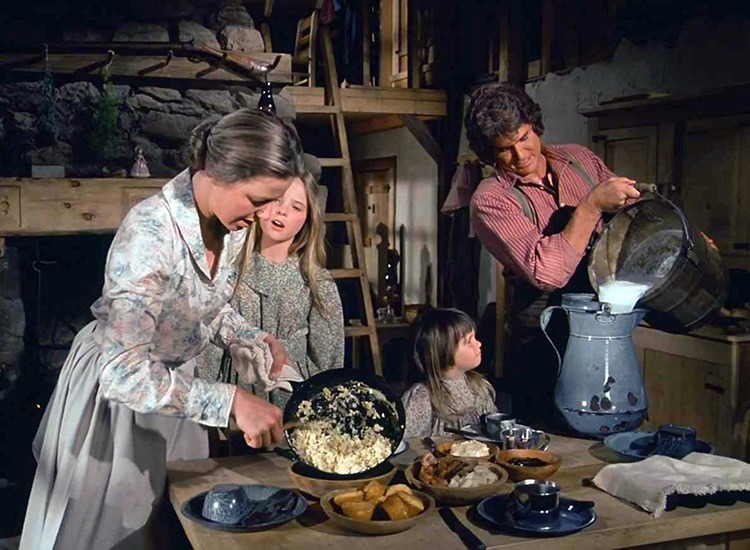 The farmhouse has not changed since Laura passed away. The rock house was bought by Rose, Laura's daughter. She built it new over the hill from the farmhouse for her parents. They lived at the rock house for 8 years and decided to move back to the farm house they so dearly loved. The museum has many family heirlooms including Laura's dad.. Charles violin. 'Carrie' was played in turns by two different children: twin sisters Lyndsay and Sidney Greenbush, and does appear frequently in the first seasons' episodes. 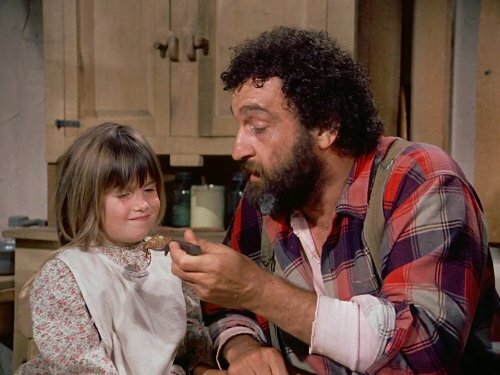 The reason you don't notice her so much is probably because she rarely had a major role and tends to just be 'carried' in the background... except in 'Ma's Holiday' (S01, E08) when Mr Edwards (Victor French) babysits her. In the later series she usually appears sitting at the front of the classroom. I love these old photos... On the far-above photo, he is probably sitting because after complications from diphteria he was left partially paralysed, later regaining use of his legs but was never able to walk properly again. This must have been very difficult for a man who had been a very active farmer up until that point. You can almost read the sadness on his face, in comparison with the photo of him younger above. 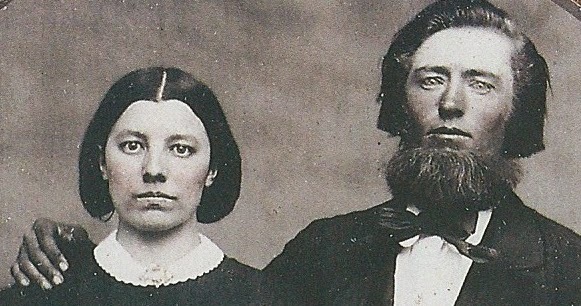 The real Ma and Pa Ingalls... I wouldn't mess with them! 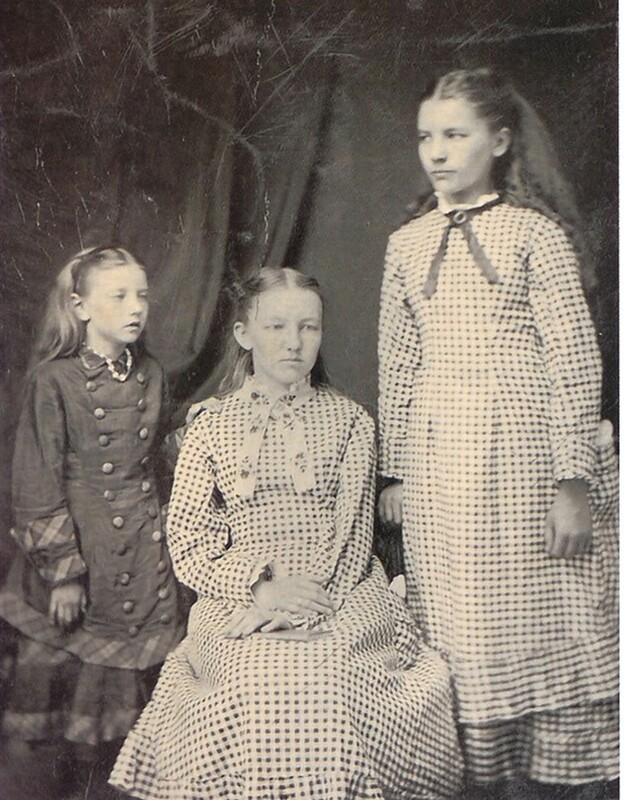 The real Ingalls girls (Carrie, Mary and Laura). You wouldn't want to mess with them either. Nice photos PennyPurple! I wouldn't mind visiting these sites either. Laura writes about the Rocky Ridge Farm in Mansfield (the white one) a lot in her last novel 'The First Four Years' (drafted in 1940, published in 1971), which relates the first four years of her and Almanzo's marriage. The acquisition of this house was a very important step for them as after all the hardships they had endured (illnesses, loss of a baby son, loss of their house in a fire, financial difficulties, etc) they were finally able to settle and rest. The book was left as Laura had written it, so not as polished as the Little House books but I still found it a great read (the themes covered are for the more mature audiences). I kind of wish there was more about Carrie. The only differences I know of between the books and the show was that Mary, never married, nor taught at a school. And that a son was never adopted. I'm sure there was more. But then the show was geared to address the more modern issues faced, they tackled a lot of issues in their run. 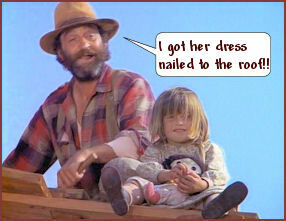 'SEAN PENN MADE HIS ACTING DEBUT ON LITTLE HOUSE ON THE PRAIRIE. What was better the books or the show? yay! I watched this show when I was a kid in the 70s and I like it alot. I loved them both. The TV show added things for drama.